Begin by greasing and lining the base of an 8” or 9” square pan with greaseproof paper/baking parchment/butter paper. Alternatively use two 8” round cake tins or one deep 9” or 10” round pan. In a sauce pan, put in the water and the chocolate together and heat until the chocolate melts. Allow to cool. In a mixing bowl, assemble 200 gm (1 1/2 cups) plain flour, 50 gm (1/4 cup) cocoa powder, 30 gm (4 tbsp) sugar, 2 tsp baking powder and 1 tsp baking soda, mix with a spoon and sieve once to make the mixture uniform. Preheat the oven at about 150 c/300F. Add in the condensed milk, oil, vanilla and melted chocolate to the flour mixture. Beat with an electric hand mixer, stand mixer, whisk or spoon just until the mixture is uniform and smooth and there are no lumps. This shouldn’t take more than a minute with an electric hand mixer/beater. Be careful not to over beat as this tends to stiffen the batter which might lead to a less softer cake. Pour the batter into the prepared cake tins and bake for 50 to 55 minutes or until a skewer or toothpick comes out clean. After the cake is done, allow the cake to rest in the tin for 3 to 4 minutes and then invert the cake on to a cooling rack. In a saucepan, put in the chopped chocolate with the water and allow it to melt. Keep stirring all the while. Once the chocolate has melted, allow it to cool down. In a bowl (or in the bowl of a stand mixer if you use one), put in the butter, sugar and the melted chocolate, alongwith the vanilla and mix until smooth. If the icing is too stiff add a few drops of milk and if the icing is thin, then add a few spoons of sugar. After the cake is cool, spread the icing all over the cake. 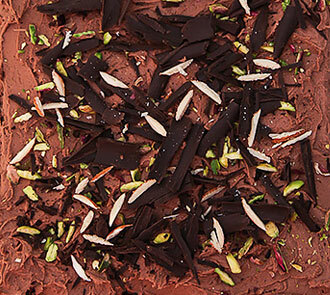 Sprinkle slivered almonds, pistachios and chocolate gratings on top of the cake.